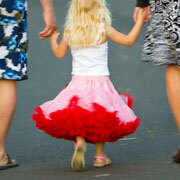 Our Baby and Girls Pettiskirts are now instore. Each Pettiskirt is made from 35 yards of the softest Nylon Chiffon. All our Newborn Pettiskirts and Girls Pettiskirts have an adjustable waist and satin ribbon. These are the highest quality Pettiskirts on the Market and are worth the investment. Pettiskirts make a wonderful and unique gift for any occassion and every little girl should have at least one pettiskirt in their wardrobe. Each Pettiskirt has layers of soft nylon chiffon which makes them so full and fluffy. Our Newborn Pettiskirt made a wonderful gift for that special little princess and also great for her first photo.